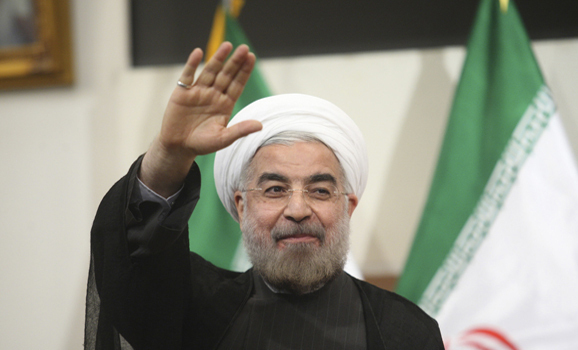 President-elect Hassan Rouhani said Sunday that the government should avoid a planned economy, instead bringing in economic experts to manage the situation. #روحانی دولت بايد ناظر و سياست‌گذار دقيق باشد و از اقتصاد دستوري پرهيز کند و فرصت بدهد فعالان اقتصادي امور تصدي‌گري اقتصاد را به دست بگيرند. The economy — devastated by years of mismanagement and increasingly harsh Western sanctions — will be Rouhani’s biggest challenge. The President-elect’s comments came a day after the Central Bank halved the national currency’s official rate against the dollar, in another attempt to shore up the economy. Meanwhile, President Mahmoud Ahmadinejad had a different message: Iran’s economy is stronger and able to “deal with fluctuations more effectively”. The outgoing President said in a televised interview that his administration would leave a “gift” to Rouhani — Iran’s foreign reserves, which he claimed are over $100 billion. Iran’s Parliament Speaker, Ali Larijani, said that Iran needed to make internal changes rather than passively assuming that the international situation would change in its favor. Larijani added that if Iran emphasized productive employment, economic development and human capital rather than bureaucracy, then Iran could make progress at the international level. As Western analysts speculate over whether President-elect Rouhani will increase Iran’s engagement with the West, the Supreme Leader’s office on Monday makes its position known by publishing an archive, on the Supreme Leader’s website, of Ayatollah Khamenei’s various statements criticizing the US. Leading MP Ahmad Tavakoli has criticized the light sentence given to Saeed Mortazavi — Presidential advisor and former Tehran Prosecutor General — over the abuse and killing of protesters in Kahrizak detention center in summer 2009. The advisor was finally tried this spring on the charge of complicity in the murder of three detainees after the disputed 2009 Presidential election. He was acquitted and given only a 200,000 Rial (about $80) fine and a five-year ban on public employment for illegal arrest and filing a false report. EA sources report that Prominent lawyer Nasrin Sotoudeh, serving a six-year sentence for “propaganda against the regime” and “actions against national security”, has been returned to Evin Prison after a two-week furlough.